Julia Child’s Split Pea Soup is the best! This soup is one of my favorite things about having leftover ham. But you don’t have to wait for the next holiday ham; it can also be made with a couple of ham hocks. It’s easy, but it takes time to make the ham stock. Try it, though, and you’ll see that it’s worth the extra time! 1. Put all of the stock ingredients in a large pot and simmer, with the lid askew, for 4 hours. At this point you can make the soup, or you can refrigerate or freeze the stock to use later. 1. Melt the butter in a large pot over medium heat. 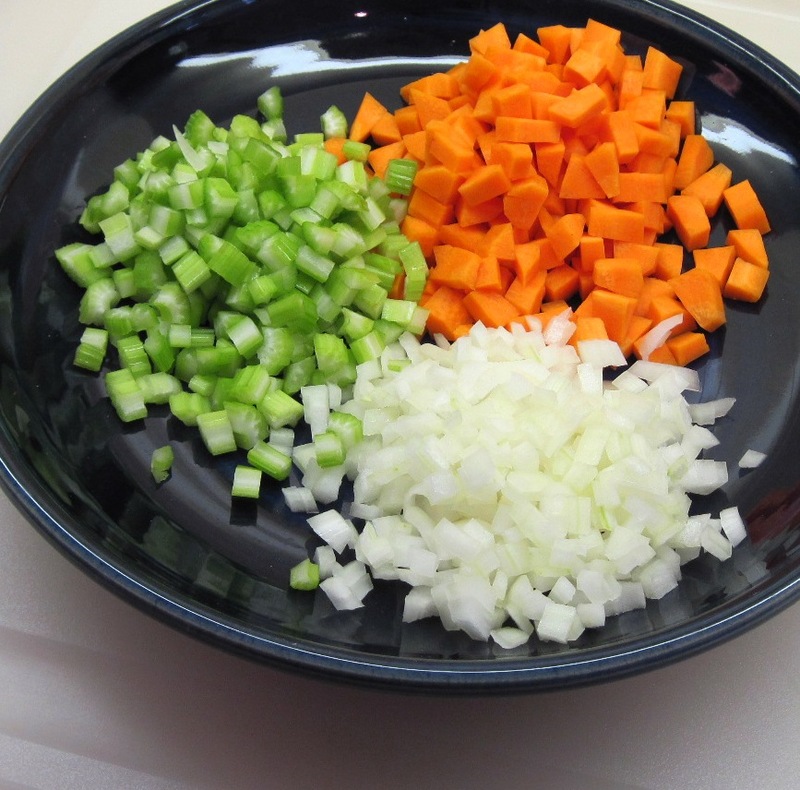 Add the celery, onions, and carrots and cook for about 5 minutes, stirring occasionally. 2. Add the flour, and cook, stirring, for 3 minutes. 3. Add the stock and split peas. Simmer, with the lid askew, for 45 minutes. Season to taste with salt and pepper. 4. Use an immersion blender in the pot to blend the soup. (I like to blend it until about half of it is blended and there are still some chunks left.) Alternatively, put some of the soup in a blender. Fill it only half full, and hold the lid on securely with a pot holder. 5. Serve with the sautéed ham (or croutons) as a garnish. Yours is a wonderful blog which I have the lucky opportunity to discover. but I must try them out to surprise my wife. are a real nuisance, a real pain and obstruct my enjoyment of your blog. I’m not sure what you mean by “The Word Press SnapShots popups”. After the title of the recipe in the post you’ll see a link for (printable recipe). If you click on that you can read the recipes without the photos. YUmm! I switched out the onions for shallots and the herb bouquet for Italian seasoning Thank you so much for the awesome recipe! Thank you, Deb! I’m already looking forward to making this with our Christmas ham bone! Thank you, this turned out so delicious! I loved the thyme in there – never would have thought of adding it myself. I’m so glad you liked it! I think Julia Child got the seasonings just right for this one! I am getting ready to make my second pot of the split pea soup (in two weeks) The best soup I have ever had.Had to buy another ham just so I could make it.My husband is getting sick of ham by now….there is always burger kink if he don’t like whats for dinner right? Keep up the good work and I will continue to steal recipes!! I’m so glad you liked it, Susan! I think it’s definitely the ham stock that makes this soup so great! Thanks so much for letting me know how much you and your family enjoyed it, Christine! I’m eager to give this a try. I usually use the recipe on the back of the package as a guide, and improvise from there. However, I got bulk peas this time, so went looking. I’d already made ham stock (minus the herbs alas). Most recipes have you cook the peas in water directly with the ham bone. The only ingredient in this recipe that I was surprised to find, and will likely leave out, is the flour. Whenever I’ve made split pea soup in the past, it was plenty thick with not flour. I suppose if you want to add that creamy starchiness, you can always add a little potato to blend in. Nancy, I think it would probably be fine without the flour. I just checked the original recipe in Julia Child’s The Way to Cook and found that Julia says the flour is used “to make a liaison so the eventual pea purée will not sink to the bottom of the soup”. Thanks for the recipe. 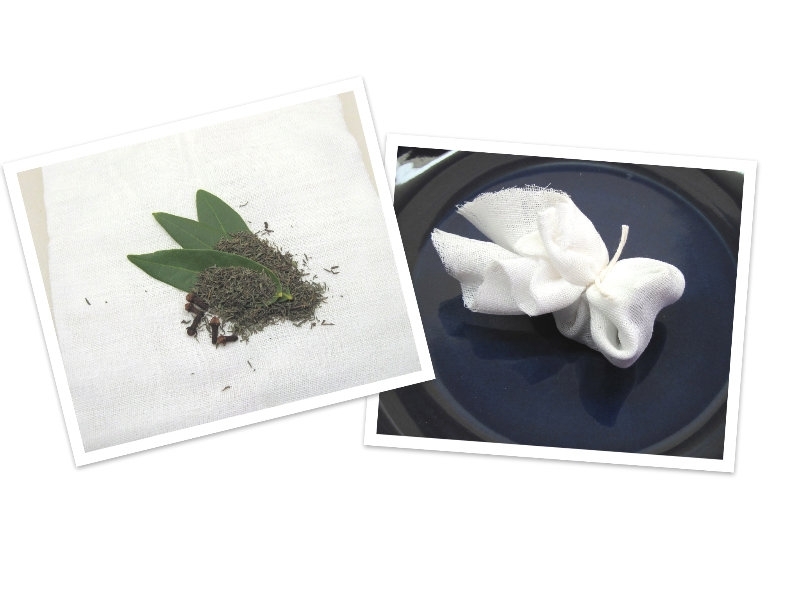 I made a few adjustments; I added some peppercorns to the bouquet garni, being a celiac I ditched the flour, I also used olive oil (EV) to saute the veggies and I increased the peas to 2 cups (1 pkg). It turned out properly thick and I don’t see any separating. Great to know, John. Thanks! This might be a silly question, but should the peas be soft before this recipe, or do you put them in dry and let them reconstitute in the recipe? Thanks! I don’t consider any question silly. 😉 You put the split peas in the soup dry. They cook and become soft as the soup cooks. Thanks for asking; someone else may have wondered the same thing. I’m about to make this soup- my first pea soup and first JC recipe!- and was wondering the same thing. I planned on just putting them in dry and letting them cook in that wonderful ham broth, so good to know my instincts were on. Thanks also for a fantastic blog, Kath! Well-chosen photos and gets right to the recipe. Can’t wait to check out your other posts! Thank you so much for your comment! I really appreciate it and I hope you enjoy the soup as much as we do. Thank you for posting this recipe. I’ve made it twice — delicious! My tweaks on the second batch: added leeks (greens from one in the ham stock, whites of two or three in the soup), allspice berries instead of clove, 2 cups of split peas, half tablespoon of tamari in the soup as the stock comes to a simmer. I’m so glad you like it, William. Thanks for your comment. Your tweaks sound great; I especially like the idea of adding leeks! Thanks, Lorene! I’m so glad you like it. In one place you you say 3 qts of water and in another, 2 qts of ham stock. I found this recipe in 1965, published by Fawcett Publications, Inc., publishers of Woman’s Day and I make it regularly with a dash of chili pepper. It is in a 12 book set, that was offered monthly, one book at a time for $1 each in the A&P super market. No mention of Julia Childs in it. About 20 years ago, Julia Childs remarked that, “Ball Park hot dogs are my favorite”. How about cutting up some of them for the pea soup?. You start with 3 quarts of water, but it cooks down quite a bit while it’s simmering to make the ham stock. For the soup, you only need 2 quarts of the finished ham stock. Hot dogs would probably go well with the soup. 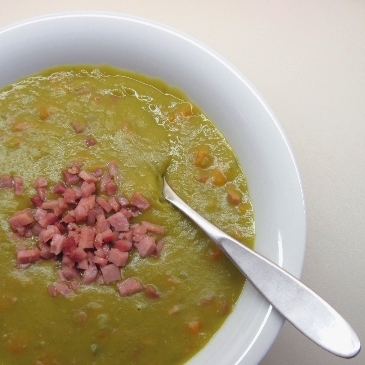 Having a beautiful meaty ham bone left from Easter dinner prompted me to look for a NEW split pea soup recipe and happened upon your posting. 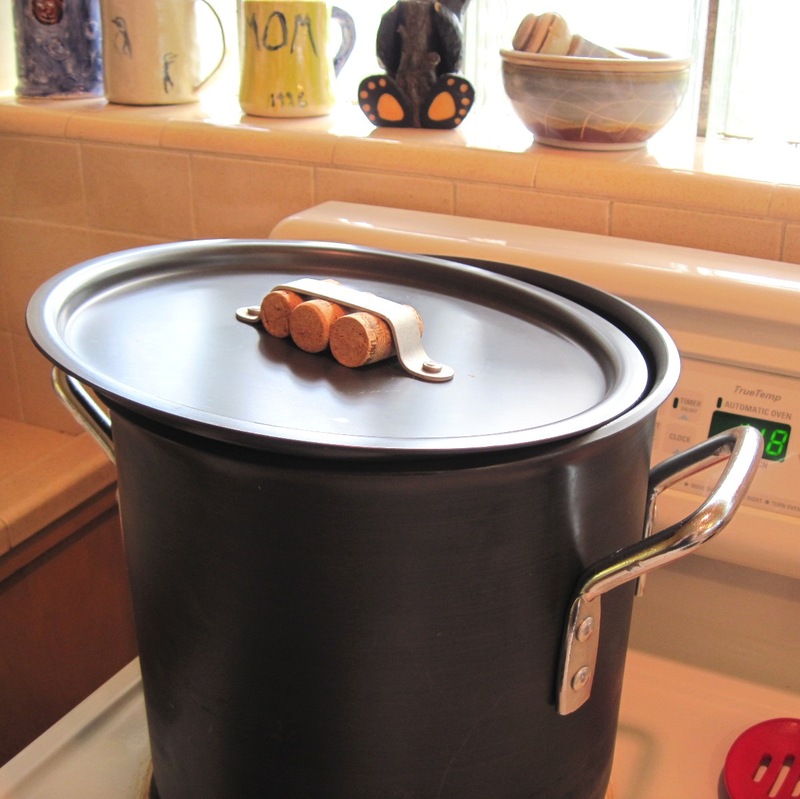 Anything from Julia Child’s is a no fail success…… The aroma from the Stock is amazing …. We will have this for dinner this evening and we can’t wait to taste. Thank You for posting. Thanks for this recipe!! It is now a regular at our house after Christmas. I love not having to pick clean the ham bone, but still feeling like I’m using as much of the meat as I can!! Delicious! Omg! This is absolutely divine! I love this recipe. So much flavor!! 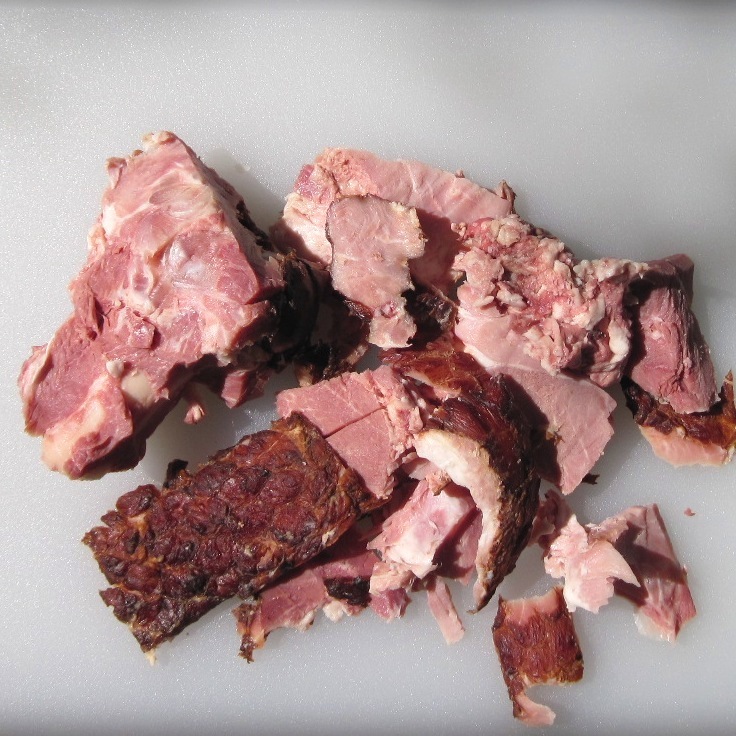 Do you think the ham stock be done in a slow cooker for 4 hours, instead of on the stovetop? We have a problem with mold in our home, so cutting down on extra condensation in the kitchen is always a plus! I definitely think that would work fine, Chris. If you try it, I’d love to hear how it turns out. The Split Pea Soup is the best Ive ever had. Thank you for your post! Thank you, Kathy! I’m so glad you like it.